My bundt tin was calling me from the cupboard and desired to be used. Ideally, I also had a glut of eggs last week and so this cake came about. The moist lemoniness was a great little January pick-me-up especially in the run up to the exams in a few weeks time. I also used cup measures for the first time as I had a folding cup measuring gadget as present from my Mum last year. Makes it easier with all these American recipes, though I have included usual metric measurements for the rest of the world. Preheat the oven to 160 ºC fan. 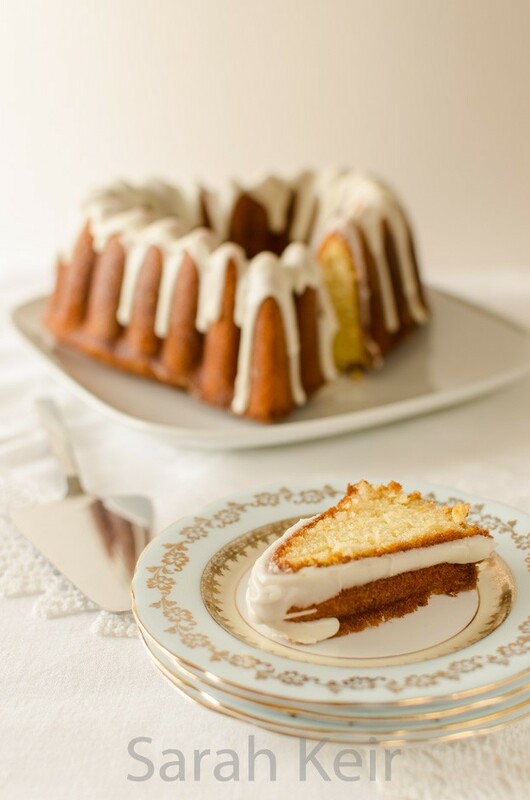 Spray the bundt tin (10 cup size) with cake release and the dust the inside with flour, knocking out the excess. 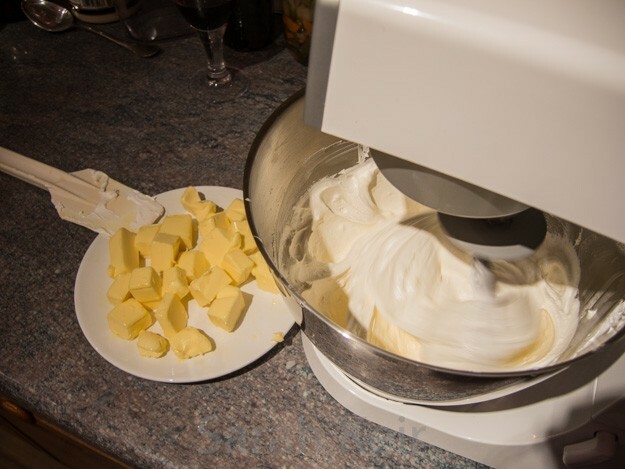 In a stand mixer with the flat beater, beat the margarine and sugar until light and fluffy. In a jug, beat the eggs with the buttermilk and vanilla extract. In a large bowl sift the flour, baking powder, baking soda and salt. Dump the egg mix, dry mix and lemon zest with juice into the stand mixer and start off slow speed to mix and then speed up to incorportate all, stopping and scraping down the sides a couple of times. Add some milk if it looks excessively stiff. Scrape into the prepared bundt tin so it is evenly distributed. Bake until the top is golden brown and a squewer comes out clean – about 45 minutes. While the cake is baking, combine the glaze ingredients, warming in the microwave to get the sugar dissolved if necessary. When the cake is done, allow to cool in the tin for 10 minutes so the sides shrink away and then turn out the right way up onto a cooling wrack. 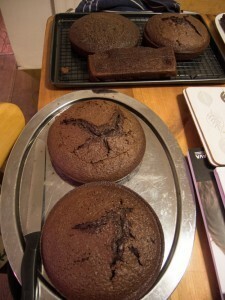 Sit the cooling wrack over a tray (carrying tray or cookie tray) and pour the glaze over the cake slowly so it sinks in. 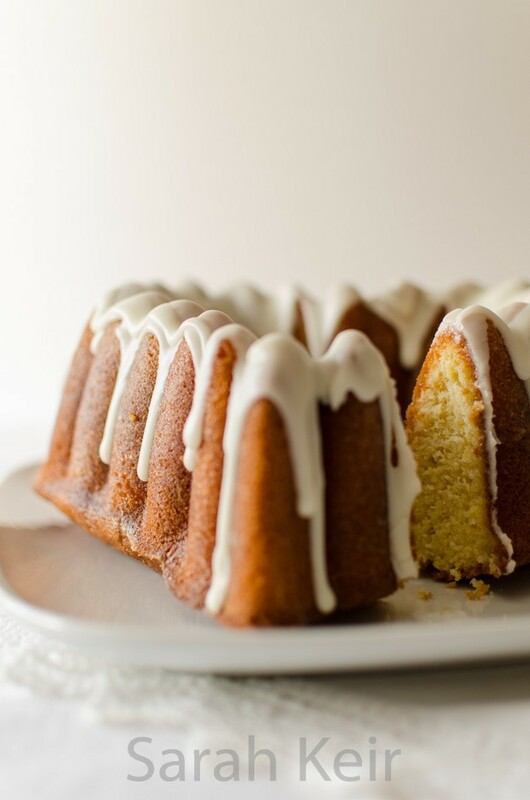 Scrape up excess glaze from the tray and pour over the cake; repeating until bored or the glaze sets. When the cake is entirely cool, mix the icing ingredients together (warm very briefly to achieve correct pouring consistency) then artfully drizzle over the cake. Serve! Gingernuts must be a uniquely British biscuit. I have not come across them anywhere else in the world (though apparently they love them in New Zealand too) and there is a dearth of recipes in blogger land. 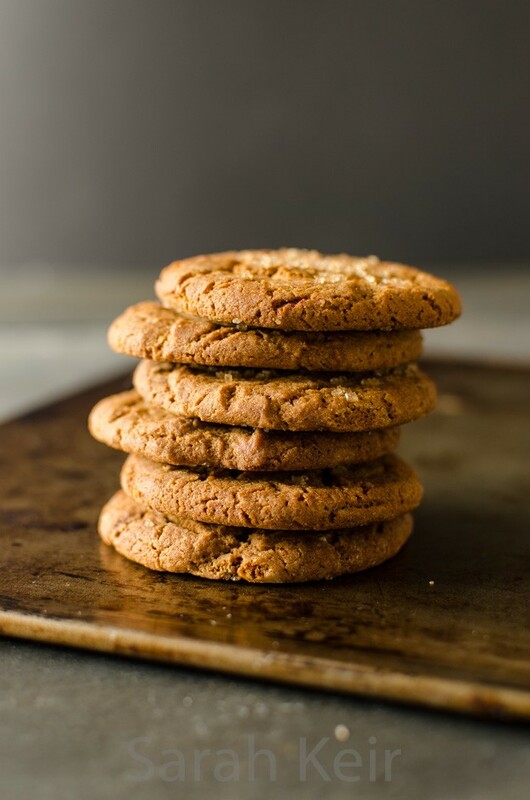 For me it is the satisfying snap and pleasing gingery warmth that makes the gingernut such a popular biscuit. It is also a top dunker for a cup of tea as it holds together well. There is no way this is an American style cookie. I am not sure why they are called ‘nuts’ rather than biscuit but that is the English language for you. 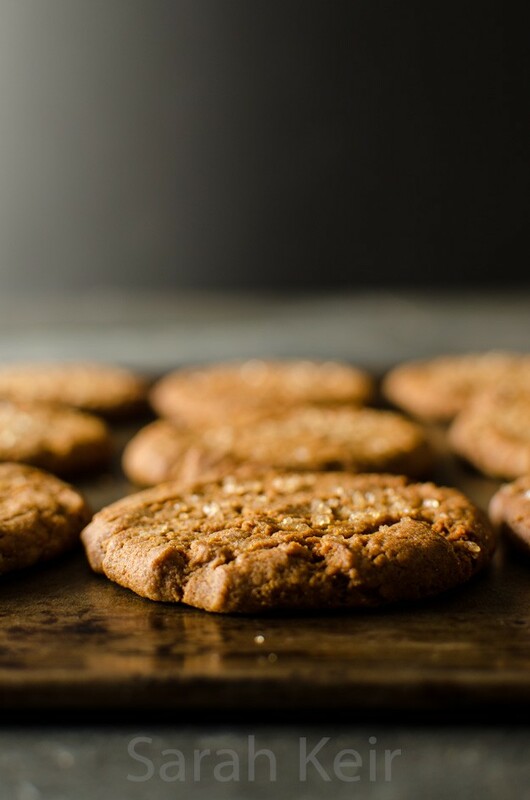 There is some suggestion that is because they are as hard as nuts when freshly baked or that the small pieces of dough that are measured out are called ‘nuts’, but whatever reason they are one of my favourite biscuits. So here is my version. As usual it is an amalgamation of several recipes with my own tweaks. 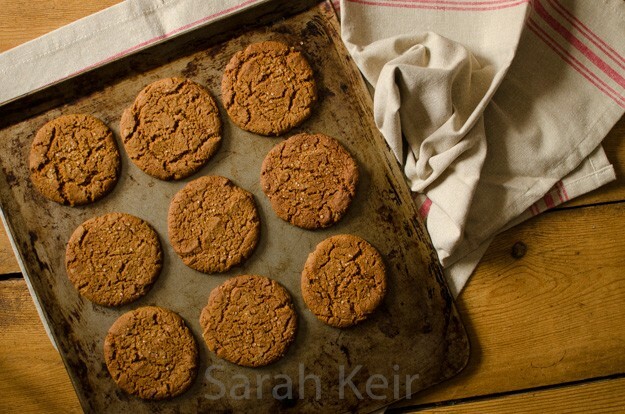 It was very easy to throw together a batch and they are so much nicer than bought biscuits. It is entirely optional if you wish to add crystallised ginger; it is not traditional to add them but I like the occassional chewy gingery nugget that they add to the experience. The gingernuts have lasted for a couple of weeks in an air tight container. If they go soft then put them on a tray in a moderately hot oven for a couple of minutes then allow to cool and they will be as good as new. Preheat the oven to 160 ºC/140 ºC fan. Line a couple of large baking trays with baking parchment. In a small pan, put the butter, golden syrup and treacle and warm over a low heat until the butter is melted. Meanwhile, in a large bowl, sift together the dry ingredients, excluding the demerara sugar and crystallised ginger. Once the butter has melted, use a wooden spoon to mix this into the dry ingredients to form a soft glossy dough. Add the finely chopped crystallised ginger at this stage if you wish. Using clean hands, break off walnut sized lumps of the dough and roll into smooth balls. Place on the prepared baking trays leaving a good 7-8cm (about 2 and 1/2 inches) between each ball. Gently press each ball onto the tray but you don’t need to make it very flat – the baking process will flatten it. 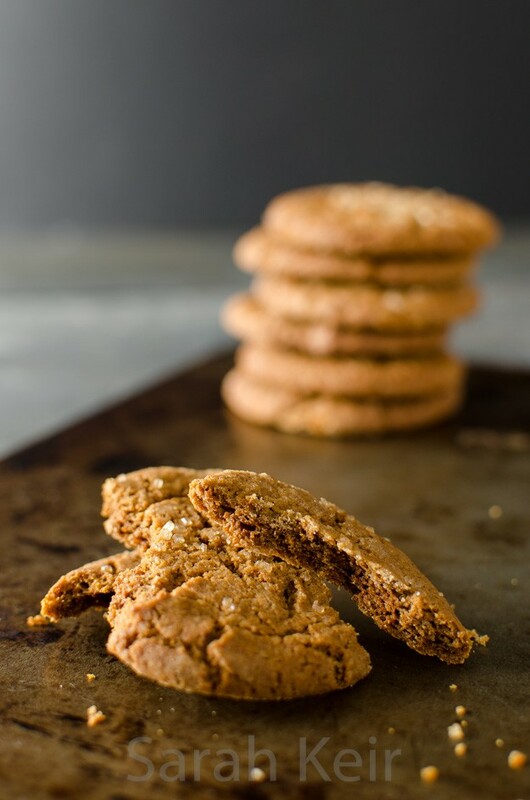 If you like, sprinkle a little Demerara sugar on top of each biscuit – it makes them pretty but doesn’t add to the crunch. Bake for 20-25 minutes, turning the trays half way through, until they have risen and deep auburn brown. Remove from the oven and transfer to cooling rack to cool completely. Store in an airtight container. 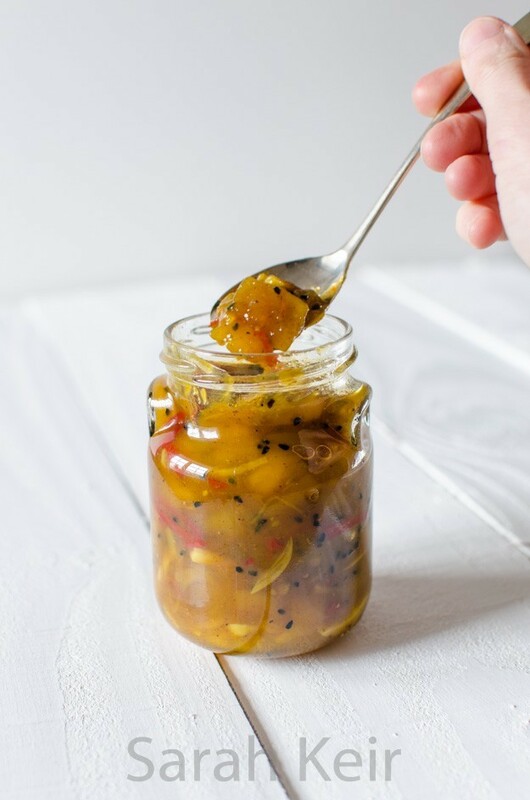 You can buy a perfectly nice mango chutney in the supermarket to be honest, but when shopping last week I could not believe my luck when I found a 2kg crate of mangoes reduced to £1! If anyone is reading this in the future when inflation has taken its toll, £1 is how much a moderate loaf of bread costs. 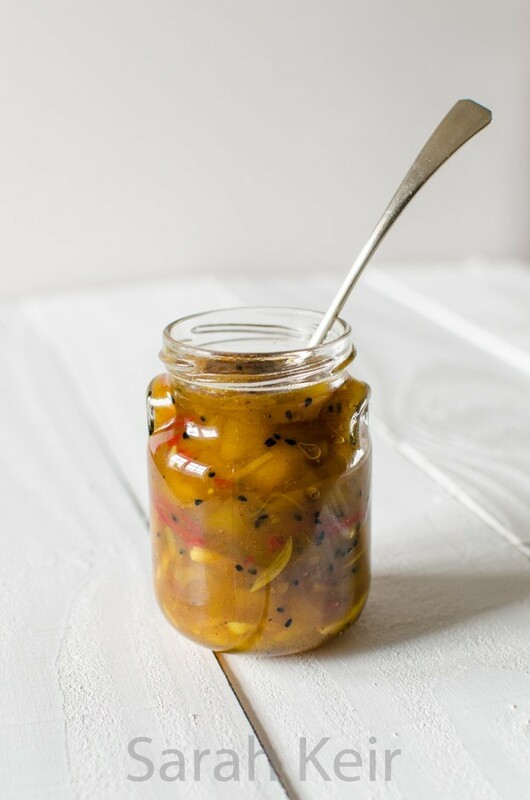 I like a chutney to go with curry that is not too spicy to counteract the heat of the curries it is served with. Probably why I like raita too, but my husband cannot understand why you would eat yogurt with a savoury dish and prefers the very hot spiced chutneys.This recipe is an almagmation of several. As normal for me, I cannot decide on one or I like components from several. You cannot really tell what a chutney is going to be like except after several months of maturing but I can feel this is going to be a good one. It smells so fragrant and I tasted a little and it has a lovely balance of sweet and vinegary. The spice that is particular to this dish is Nigella seeds, also known as Kalonji. They are sometimes called black onion seeds but are unrelated to onion and have a mild peppery flavour that can also be a little bitter. They are commonly used in Indian cooking such as this chutney and dhals, and are also used in a decorative way sprinkled over flat breads like naans. Prepare the mango; peal, stone and chop roughly. Dry fry the dry spices except the nigella seeds until fragrant then grind in mortar and pestle or spice grinder until fine. Add all the ingredients to a large preserving pan and heat gently until all the sugar is dissolved. Now simmer gently for about an hour, stirring frequently towards the end. When thick, pot hot into hot sterilised jars and seal. Leave for a couple of months to mature before using. 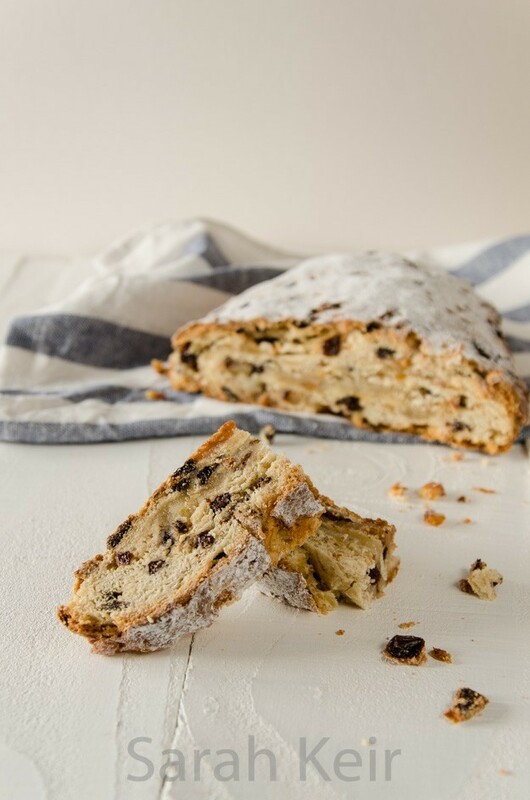 Stollen is a traditional German Christmas cake bread found all over the continent at this time of the year and making its way over to the UK. Rather than buying an over priced cake drenched in that awful sweet powder that is not sugar, I decided to give it a go making one myself especially as it would give me an excuse for trying out an enriched dough recipe. An enriched dough contains butter or eggs (this recipe has both) which means the action of the yeast is suppressed. Basically this recipe cannot be rushed as the yeast will take longer to rise so find a day when you are in all day and start early in the morning. Our house does not have heating during the day so to give the yeast some warmth in which to do its magic, I placed the covered bowl on a vivarium heat mat. This heat mat is essential for me to make bread as the house is fairly cool even in summer – it only cost about £10 from eBay (something like this). 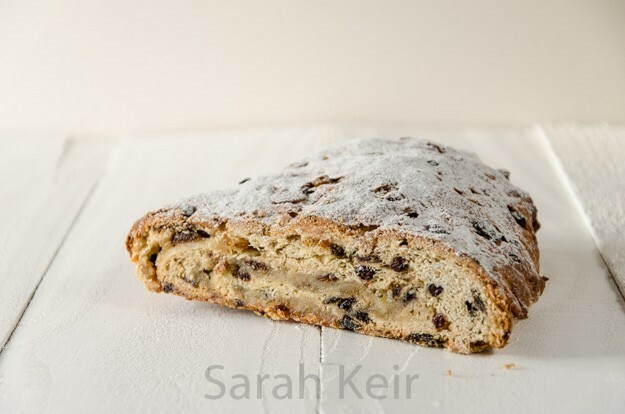 I am not sure if you would call stollen a yeasted cake or an enriched bread – they are the same thing I guess. The bread part is sweet and almost cake like in taste and texture, the mixed fruits add interest to the texture and the spices just scream Christmas. I love the taste of marzipan so I cannot think of anything better than stollen but if you don’t like marzipan I suppose you could leave it out (you heathen). I think I left my stollen to prove too long the second time as it slumped in the middle. Has anyone else had this problem? I also made it as one huge stollen but it was a real monster and would probably do better as two smaller loaves. 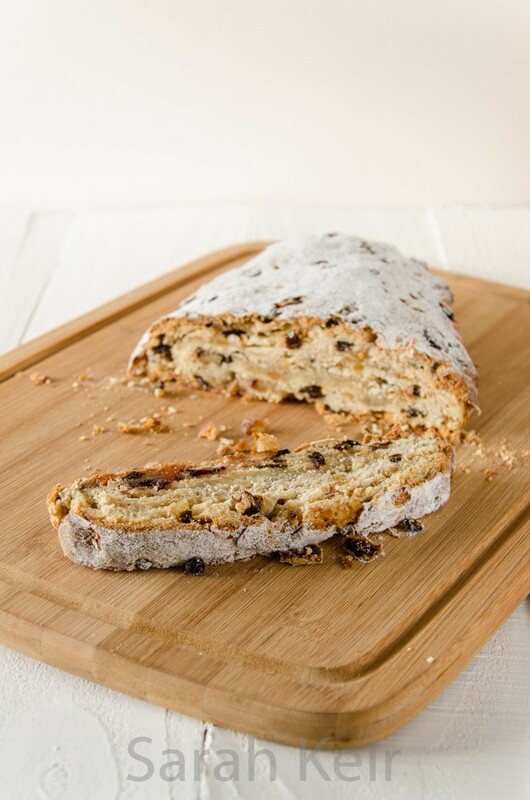 Stollen freezes well once baked so by having two loaves, you could have fresh stollen for the whole Christmas period! In a large bowl put the flour and sugar. Add the yeast to one side of the bowl and the salt on the other. Add the melted butter, beaten egg, vanilla extract and most of the milk and using your hand, mix well together until comes together. Use the extra milk if the dough is dry; this dough starts off very sticky but will become shiny, smooth and elastic as it is kneaded. It needs kneaded for 10 minutes. When the dough is soft and elastic, place in a well floured bowl and cover with cling film. Leave to rise somewhere warm to double in size – this may take a couple of hours. In a clean bowl, mix together the filling ingredients except the butter and marzipan. Once the dough has risen, knock back the dough in the bowl and then transfer the dough to the filling bowl. 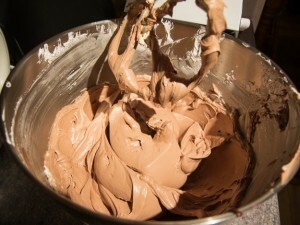 Mix the filling into the dough by kneading the dough from the outside of the bowl into the centre. When all the filling is incorporated into the dough, turn the dough out onto a lightly floured surface and roll out to a rectangle (either one large one or two smaller ones). Sticking down the edge of the dough to the work surface nearest you and rolling away from the body is the easiest way of achieving this. Roll out the marzipan to a rectangle that fits within the dough the dough rectangle. Brush the dough rectangle with the melted butter, lay over the marzipan and roll up the whole lot, making sure the marzipan is completely enclosed and the long edge and ends are well sealed (squidge with fingers). Place this rolled loaf or loaves onto a floured baking sheet, place inside a large plastic bag (I had to use a bin bag to get one big enough) and leave somewhere warm to prove. It needs to double in size again and when touched, the surface springs back. Preheat the oven to 180 ºC/fan 160 ºC. Bake the loaf/loaves for 40 minutes to an hour depending on the size; they should be pale golden. When the loaf/loaves are removed from the oven,place on a wire rack, brush with the last lot of melted butter and dust liberally with icing sugar. Once cool, wrap in paper or cling film to store. Keeps for 3 or 4 days. To remind you what I used these recipes for, here a picture of the finished cake. Unfortunately I haven’t got a picture of the layers inside as I forgot to take my camera to the party where it was served and I was asked to be the one to serve up the cake. It is kind of hard destroying your own piece of art but it was in a good cake eating cause! 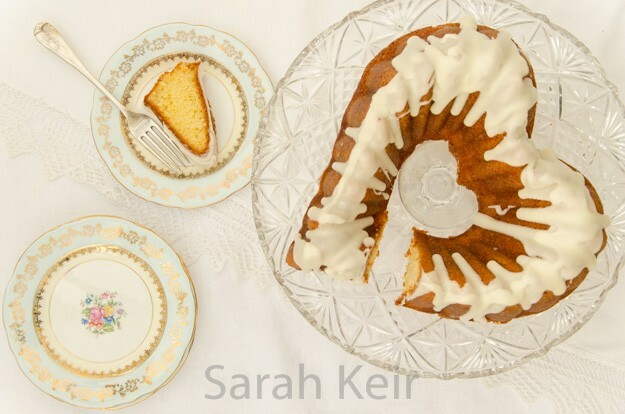 The cake recipe is slightly modified one from Donna Hay, an Australian online magazine, but has been extensively reused in blog land. Despite having never made this recipe before and it being a little odd (gallons of water in the recipe) I felt sure enough to give it a go for the cake proper, though I did have back up ingredients in case I needed to go back to a regular sponge cake. I used one batch of the cake recipe to make three 8″/20cm layers and a second batch to make one more tier and a tray bake of 25 x 35 centimeters . 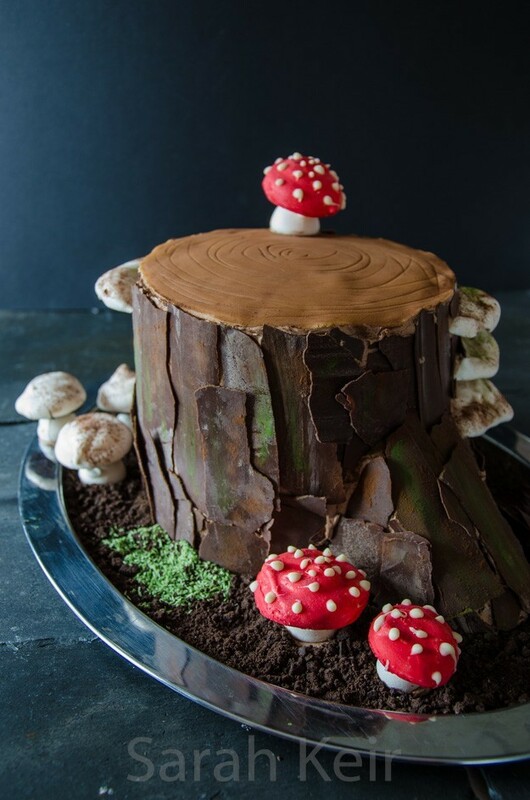 The orginal recipe states to cook in two 20cm tins and then cut each in half to get the four layers but I wanted stouter layers for the stump cake so went with an extra layer. I think either would work. This cake is lovely and moist and despite being flavoured only with cocoa powder, has a surprisingly good chocolate taste. I don’t think it would last very long as it is made with a lot of water so is likely to dry out quickly. It didn’t last long enough to find out this time! Grease and line with baking parchment (silicone paper) two or three 8″/20cm cake tins. Place the water, butter and cocoa powder in a medium saucepan over a low to medium heat, stirring occassionally until all the butter is melted and the cocoa powder has dissolved and then take off the heat. In a large bowl, mix the flour, sugar and bicarbonate of soda. In a jug beat the eggs and then beat in the buttermilk (or yogurt/milk mixture) and vanilla extract. Mix the wet ingredients into the dry (make sure the cocoa/butter mix is no warmer than blood temperature), scrapping down the sides of the bowl and bottom a couple of times. This is much easier to mix in a stand mixer with the mixer paddle attachment. Divide the batter between the prepared tins and place all the cakes on the same shelf in the preheated oven. Cook for 40-45 minutes. They are done when a skewer inserted into the middle of the cake comes out clean and the cake has shrink away from the sides of the tin a little. Leave to cool in the tins for 10-15 minutes then turn out on a wire rack to cool completely. I covered them with a clean tea towel while they cooled to stop them drying out (and stop cat hairs getting on them!). 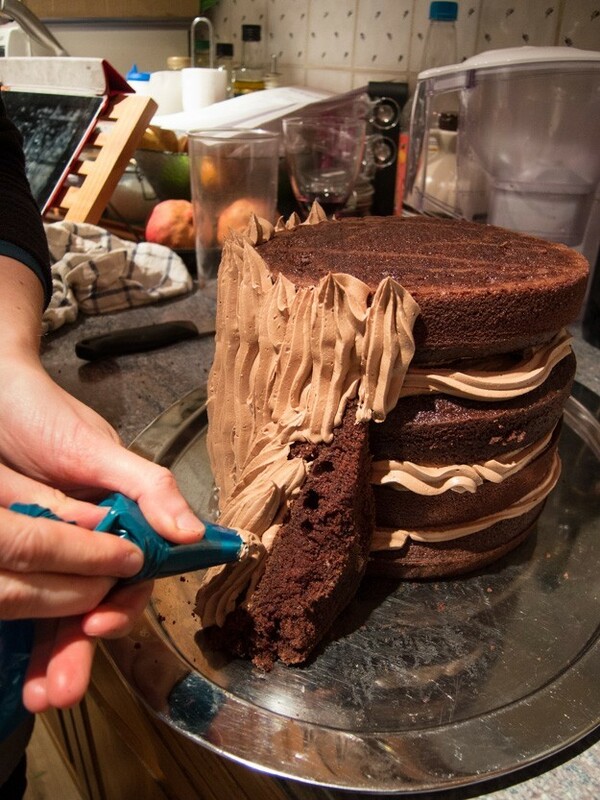 Trim the tops of the cakes level before assembling. Swiss meringue buttercream sends even experienced bakers into fits of weeping. Too many bowls of wasted buttercream when it splits, curdles or seizes. My previous attempts at this type of icing where not particularly successful (see last years icing for the wedding cake) but the more I read about it, the more I wanted to give it another try. Several times during the process I thought it looked a disaster, but as I read other blogs about just keep whipping it and it will come right, low and behold that is what happened. I thought the butter had been too cold when I added it because half way through I could still see lumps of butter but I just turned the mixer up to medium/high and left it for 15 minutes to console myself reading about other peoples Swiss meringue buttercream disasters. When I looked back, it was perfectly smooth and just as it should be. 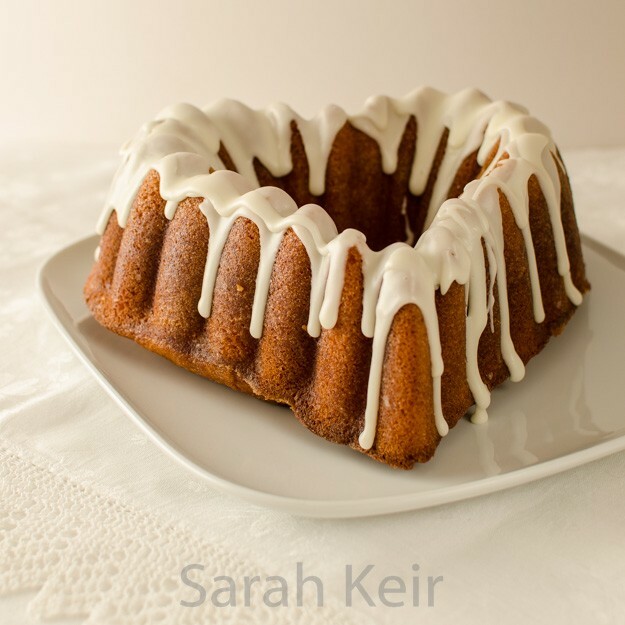 It wasn’t a fast process to make this icing but the results are spectacular – soft, silky smooth with a perfect balance of butteriness and sweet without cloying. Just like eating chocolate mousse on a cake! Perfect! This recipe made enough to ice the 4 layer stump cake (between layers and all over) and a small amount for the top of the tray bake. This icing pipes very well but you would need probably double if you were going to pipe on the textures, whereas I only needed a thinner layer which would hold on the chocolate bark. This icing keeps for up to a week in the refrigerator but it needs to come up to room temperature before using (and will need rewhipping for 5 minutes) or eating. It can apparently be frozen for a month or two but I haven’t tried this. Place the egg whites and sugar in the mixing bowl of the stand mixer and sit this over a saucepan of barely simmering water (a bain marie). Using the whisk attachment from the stand mixer, whisk pretty well continuously (but it doesn’t need to be vigorous) until the sugar has completely dissolved (cannot feel any grains under fingers) and the mixture looks opaque white. If you have a sugar thermometer, you are aiming for 60-70 ºC or 150-160 ºF. Remove the bowl from the heat and fit to the stand mixer with the whisk attachment. Whip on high speed until completely cold i.e. the bowl feels neutral to the touch. This took me at least 15 minutes and I was getting impatient to I took the bowl out of the stand mixer and put it outside for half an hour and that cooled it down. The critical bit now is the temperature of the meringue and the butter. The meringue must be cool and the butter must be soft but still cool (I had to put it back in the fridge for a little to cool off as the kitchen was too warm as the oven was on). Once all the butter is added, you can add the flavourings and salt, and colourings you might like. In this case it was chocolate, but like the butter it must not be warm when added. Vanilla extract and bean puree can be added, or lemon zest and oil, fruit purees (make sure concentrated so minimal water is added). *If the mixture looks like it is curdling or lumpy then don’t add any more butter, set the mixer up to high and leave until it has come back together then you can resume adding the butter. If the buttercream seems too loose then put in the fridge for a while before trying to pipe or ice. Conversely, if the buttercream has become too firm (for example kept in the fridge) and it does not become satiny smooth after 5 minutes of rewhipping then microwave a quarter of the buttercream for just 10 seconds, add this back into the main buttercream and continue whipping.